These initiatives aim to provide counseling and friendly supportive spaces for individuals with diverse sexual and gender identities and practices. 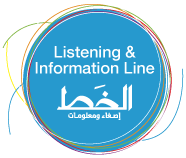 It is divided to two venues, the first is the National Hotline, or Listening and Information Line (www.alkhat.org), which is a peer-to-peer support service operated by a team of volunteers from alQaws. The hotline also includes an online chat platform (www.alkhat.org) as a more discreet option. The second venue is the Support Services that includes Groups & One-on-One Psychological Support.